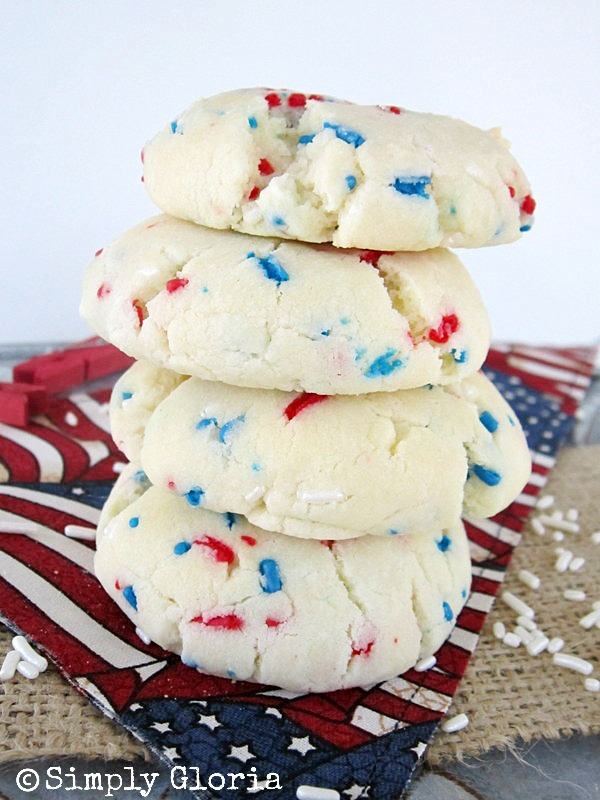 Whether you’re hosting the star spangled party or just going as a guest, having cookies on the table are a huge hit! 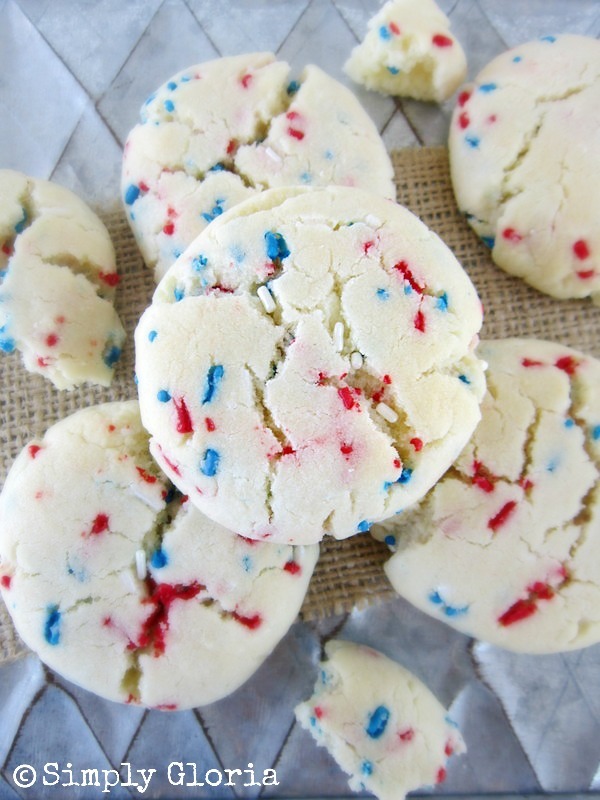 These July 4th Sprinkle Cookies are the perfect party treats! They are super easy and fast to make. Because…they are made with a vanilla cake mix! Baking cookies (from scratch) are one of my most favorite treats to bake…about 4 times a week, actually! But, the simplicity and texture of cookies with a cake mix is totally worth it. They’re fast to make. And not to mention, super soft to eat! 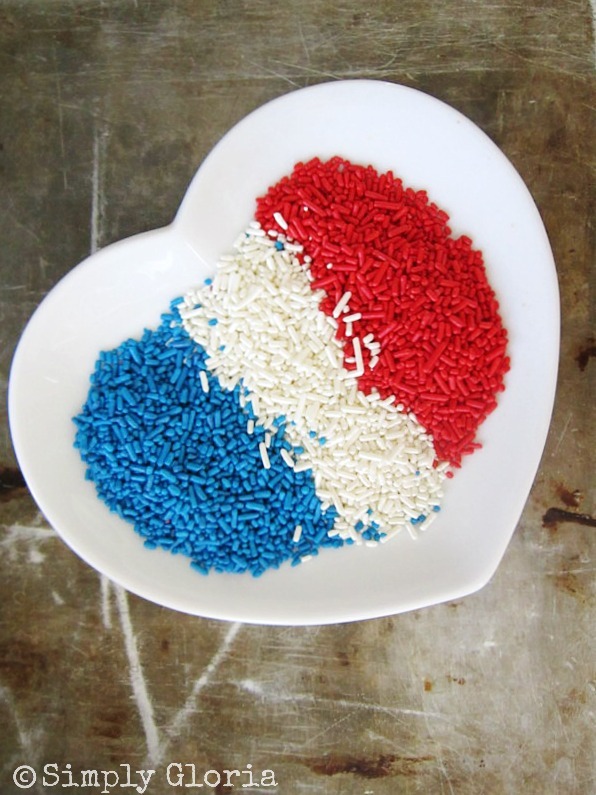 And don’t forget about some red, white, and blue sprinkles/jimmies! In a large (microwave safe) bowl, melt the butter. Stir in the vanilla cake mix. Add the beaten egg and extract. Then, add the white chocolate chips with the sprinkles. Roll the cookie dough into a small ball. Gently smash with your palm on the baking sheet. Bake them in a preheated oven at 350 degrees for 8-10 minutes. Allow the cookies to finish baking on the baking sheet for another 5-7 minutes after you take them out of oven. See how plump these cookies are? 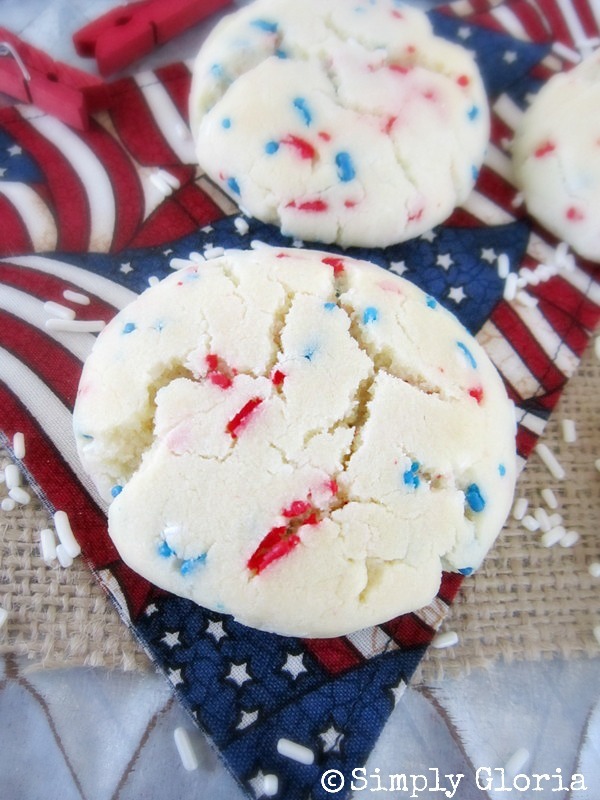 Your family and friends will think you’ve baked these July 4th Sprinkle Cookies all through the night! When really, these cookies only took you less than an hour from start to finish! Enjoy! This recipe makes about 18-22 cookies. Store in an air tight container. Cookies will stay fresh and soft for up to 3 days. In a large (microwave safe) bowl, melt the butter. Stir in the vanilla cake mix. Add the beaten egg and extract. Pour and stir white chocolate chips with the sprinkles. 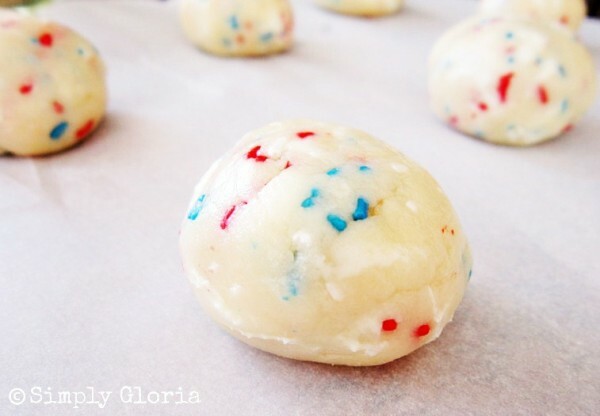 Roll the cookie dough into a small ball. Gently smash with your palm on the baking sheet. Bake for 8-10 minutes. Allow the cookies to finish baking on the baking sheet for another 5-7 minutes after you take them out of oven. 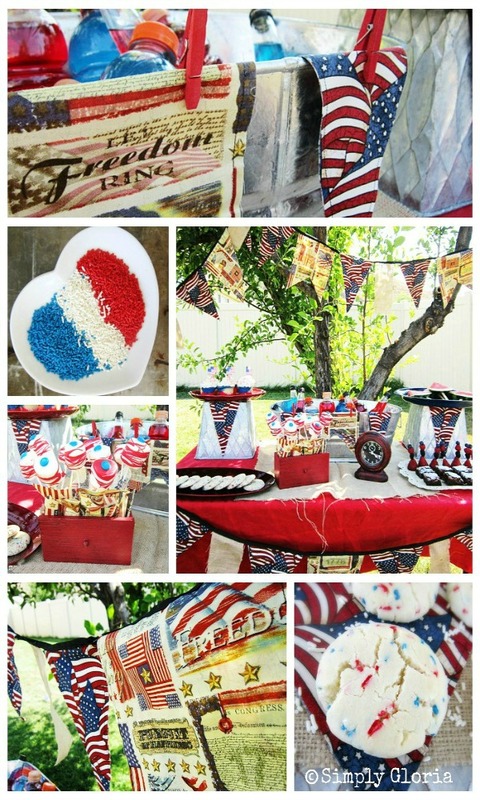 For more 4th of July ideas, see how to display a fun July 4th Dessert Table for all the fun goodies! 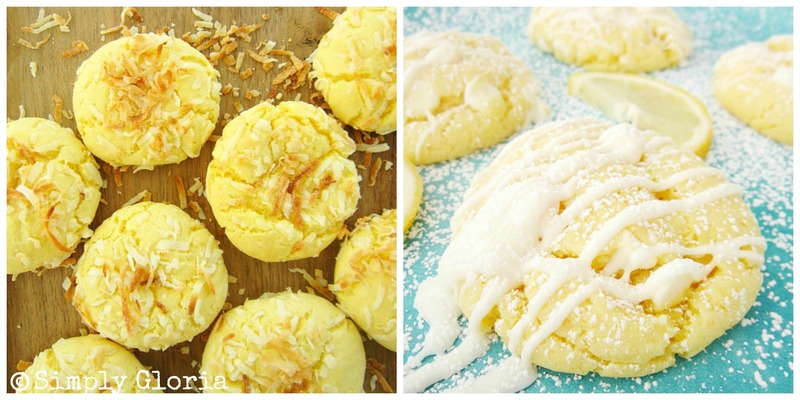 Also, here are some more easy cake mix cookies! I was wondering how you got them so PERFECT! Cake mix, swear to God, no matter what I have tried instead, it comes out the winner, every time. They are beautiful and I bet so tasty! 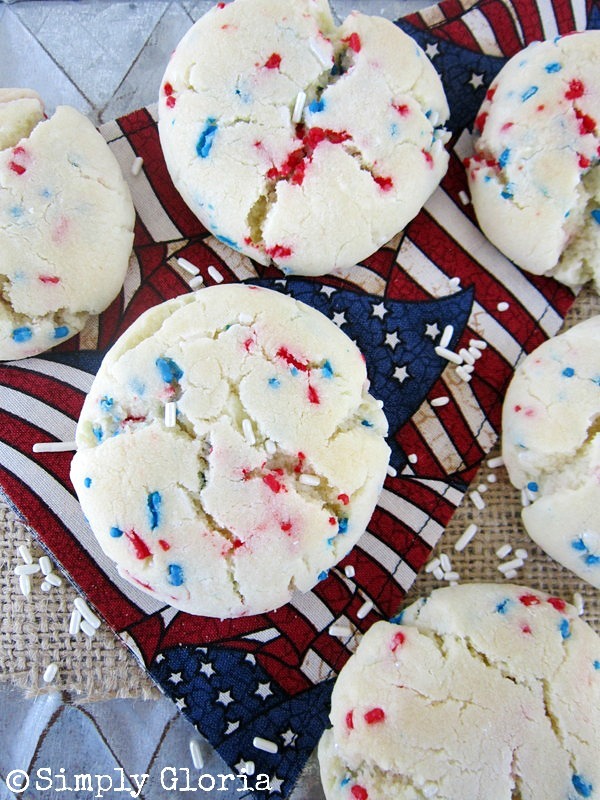 What a fun, patriotic cookie Gloria! Who would love to have a plateful of these at their 4th of July celebrations! Your pictures are gorgeous! You are so kind, Tanya! Thank you!! Eric, me too! Wish the holiday was more towards the weekend. But it’ll be a blast any ways, right?! Thanks so much Eric! 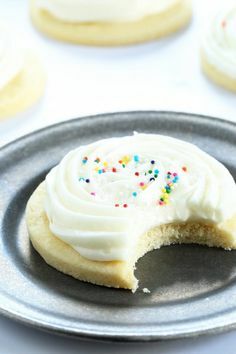 I love using cake mix in my cookies! It makes cookies so soft and puffy looking, which I adore. SO pretty. I actually love melting white chocolate into sugar based cookies. It gives the cookies a surprisingly soft texture and a wonderful taste. You’re so right, Reba! Course, I love white chocolate in a lot of things. Thank you!! Even though I’m not American, I do have an American boyfriend and can still legitimately make them for myself because they’re also the colour of the Union Jack 😉 I’m good at making excuses for eating cookies! You’re so funny, Julia! I love having any excuse for making/baking/eating cookies! These cookies look like the perfect popable cookie. Meaning I could perfectly see myself popping a few of these, okay not just a few 😉 White chocolate and cookies, I LOVE! Can’t believe the 4th is next week! Where has the year gone?! I can’t believe how this yr has flown, too! I just don’t want summer to be gone so fast. 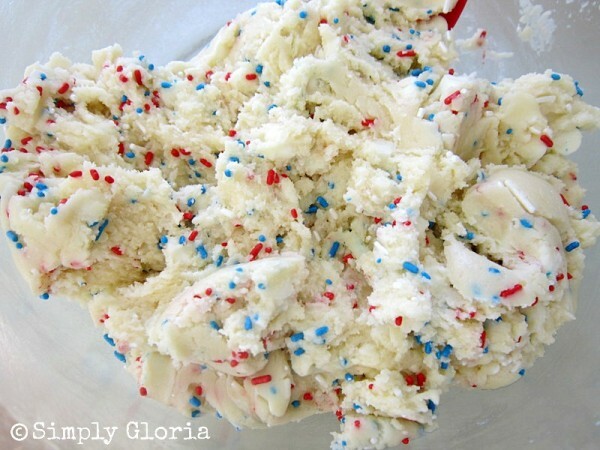 Gloria, I love this for the holiday – so festive and I bet they taste delicious! i made just the perfect tray to serve them on, too! Thanks for sharing, am pinning and sharing on my FB page tonight! Cindy Eikenberg recently posted…Homemade in the USA Upcycled Tray + A Winner! Gotta love the cake mix for that reason! I will usually buy a bunch (for baking bars or cookies) when they are on sale. Thanks Trish! Thank you for your kind words, Kelly! Hope you had a fun bday! Anne, thank you again for the mention on twitter! Always makes me happy when I read your comments! I’m a “go with the flow” kinda girl, too! We usually just wing it…and it all lands just fine! Thanks Ashley! absolutely love cake mix cookies AND sprinkles. best treat ever. Love how simple and really no measuring when making cookies with a cake mix…thank you Carissa! I’m so glad you like the recipe…thank you Lisa! Love using those cake mixes for all kinds of things!! 😉 I could eat probably eat my weight in these little gems!! 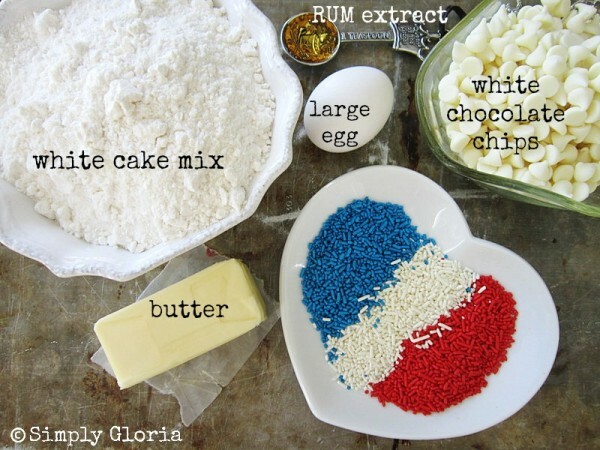 I love how cake mixes are so universal! Thanks Jocelyn! SO much fun! Featuring tonight Gloria! Trish – Mom On Timeout recently posted…Practically Perfect Pineapple Punch and a Giveaway! Wanted to say thank you again! Claire @ A Little Claireification recently posted…Best Of The Weekend | A HUGE Welcome to Cooking On The Front Burner!! You’re so sweet, Claire! They’re really fun to make… quick and easy. That’s how I roll! Could these cookies be made into bars with a 9×13 pan? Stephanie, to be honest I have not tried that yet… but I can bet they would work out in a 9×13 pan. Now, I think I’m going to go make some in a pan… delish! Thank you for stopping by! Perfect for the 4th! We made ours with butter and almond extract and skipped adding white sprinkles since the cookies and chocolate chips were already white. Easy dough to mix up by hand! Might be worth it to chill the dough slightly before rolling into balls.